To celebrate the 100th anniversary of the Teddy bear Steiff was invited by Disney Epcot® to create a fabulous Steiff collectors’ extravaganza in Epcot® Center, Orlando, Florida. 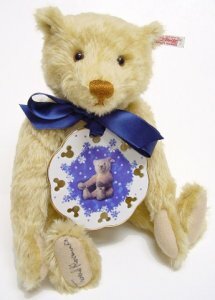 For this event a unique limited edition Steiff Teddy bear called ‘Richard’ was created which could only be purchased at Epcot® at the First Steiff Event. Richard is a 12"/30 cm, fully jointed, antique gold mohair, growler, old fashioned bear which comes with a specially created ceramic pendant and a specially created Disney pin celebrating 100 years of Steiff Teddy Bears. Signed by Tweed Roosevelt.